^ 2.0 2.1 Heikkilä, M., Mutanen, M., Wahlberg, N., Sihvonen, P., & Kaila, L. (2015). Elusive ditrysian phylogeny: an account of combining systematized morphology with molecular data (Lepidoptera). BMC evolutionary biology, 15(1), 260. ^ Mitter, C., Davis, D. R., & Cummings, M. P. (2017). Phylogeny and Evolution of Lepidoptera. Annual review of entomology, 62, 265-283. ^ Condamine, F. L., Toussaint, E. F., Clamens, A. L., Genson, G., Sperling, F. A., & Kergoat, G. J. (2015). Deciphering the evolution of birdwing butterflies 150 years after Alfred Russel Wallace. Scientific Reports, 5, 11860. ^ 大衛．卡特. 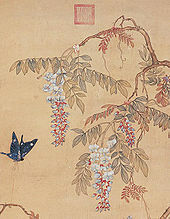 蝴蝶. 中國友誼出版公司. 2007年7月. ISBN 9787505713222. ^ Williams, Ernest; Adams, James; Snyder, John. Frequently Asked Questions. The Lepidopterists' Society. [9 September 2015]. （原始内容存档于2015年5月13日）. ^ Venkatesha, M. G.; Shashikumar, L.; Gayathri Devi, S.S. Protective Devices of the Carnivorous Butterfly, Spalgis epius (Westwood) (Lepidoptera: Lycaenidae). Current Science. 2004, 87 (5): 571–572. ^ 9.0 9.1 潘瑞輝 譚健聰. 鳳園生態系列－香港觀蝶入門手冊. 香港: 大埔環保會 鳳園蝴蝶保育區. 2011年8月. ISBN 978-988-15271-1-0. ^ Ball, P. (2012). Nature's color tricks. Scientific American, 306(5), 74-79. ^ Monteiro, A.; Pierce, N. E. Phylogeny of Bicyclus (Lepidoptera : Nymphalidae) Inferred from COI, COII, and EF-1 Alpha Gene Sequences. Molecular Phylogenetics and Evolution. 2001, 18 (2): 264–281. PMID 11161761. doi:10.1006/mpev.2000.0872. ^ Peggy Notebaert Nature Museum. Larva Legs. Chicago Academy of Sciences. [7 June 2012]. （原始内容存档于19 March 2012）. ^ Fiedler, K.; Holldobler, B.; Seufert, P. Butterflies and Ants: The Communicative Domain. Cellular and Molecular Life Sciences. 1996, 52: 14–24. doi:10.1007/bf01922410. ^ Robbins, Robert K. The "False Head" Hypothesis: Predation and Wing Pattern Variation of Lycaenid Butterflies. American Naturalist. 1981, 118 (5): 770–775. doi:10.1086/283868. ^ Featured Creatures: Giant Swallowtail. University of Florida. [12 September 2015]. ^ Stevens, M. The Role of Eyespots as Anti-Predator Mechanisms, Principally Demonstrated in the Lepidoptera. Biological Reviews. 2005, 80 (4): 573–588. PMID 16221330. doi:10.1017/S1464793105006810. ^ 19.0 19.1 Edmunds, M. Defence in Animals. Longman. 1974: 74–78, 100–113. ^ Chattopadhyay, J. 2011. The structure and defensive efficacy of glandular secretion of the larval osmeterium in Graphium agamemnon agamemnon Linnaeus, 1758 (Lepidoptera: Papilionidae). ^ Scoble MJ. 1992 The Lepidoptera. Form, function and diversity. Oxford, UK: Oxford University Press. ^ Kristensen NPAckery PR, de Jong R, Vane-Wright RI. 1998 The butterflies: Hedyloidea, Hesperoidea and Papilionoidea. In Lepidoptera: moths and butterflies 1 Handbuch der Zoologie/handbook of zoology IV/35 (ed. Kristensen NP), pp. 263–300. Berlin, Germany: Walter de Gruyter. ^ Kristensen NPKristensen NP, Skalski AW. 1998 Phylogeny and palaeontology. In Lepidoptera: moths and butterflies 1 Handbuch der Zoologie/handbook of zoology IV/35 (ed. Kristensen NP), pp. 7–25. Berlin, Germany: Walter de Gruyter. 周堯. 中國蝶類志. 中國: 河南技術出版社. 1992年. ISBN 75349-15740. 王敏, 范驍凌. 中國灰蝶志. 中國 鄭州: 河南科學技術出版社. 2002-04. ISBN 7534923840. 袁鋒, 袁向群, 薛國喜. 中國動物誌 昆蟲綱 第五十五卷 鱗翅目 弄蝶科. 中國 北京: 科學出版社. 2015. ISBN 9787030439147. 寿建新, 周尧, 李宇飞. 世界蝴蝶分類名錄. 中國: 陝西科學技術出版社. 2006-04-01. ISBN 9787536936768. 呂至堅, 陳建仁. 蝴蝶生活史圖鑑. 台灣: 晨星出版有限公司. 2014年3月23日. ISBN 9789861777849. 徐堉峰. 臺灣蝴蝶圖鑑．上【弄蝶、鳳蝶、粉蝶】. 台灣: 晨星出版有限公司. 2013年2月10日. ISBN 9789861776705. 徐堉峰. 臺灣蝴蝶圖鑑．中【灰蝶】. 台灣: 晨星出版有限公司. 2013年2月10日. ISBN 9789861776705. 徐堉峰. 臺灣蝴蝶圖鑑．下【蛺蝶】. 台灣: 晨星出版有限公司. 2013年3月10日. ISBN 9789861776682. 楊建業, 饒戈, 丘紹文. 香港蝴蝶圖誌. 香港: 香港鱗翅目學會. 潘瑞輝, 楊英豪. 香港蝴蝶百科 辨蝶篇. 香港: 香港鱗翅目學會. 2012年6月. ISBN 9789628694372. 羅益奎, 許永亮. 郊野情報蝴蝶篇. 香港: 漁農自然護理署. 2004年. ISBN 9621428432. Bascombe, M.J., Johnston, G. & Bascombe, F.S. The Butterflies of Hong Kong. 倫敦: Academic Press. 1999年. ISBN 9780120802906.